The European Union’s Civil Protection and Humanitarian Aid Operations department (ECHO) confirmed last week fresh funding worth €2 million to the International Organization for Migration (IOM) to support refugees and host communities in western and northwestern Uganda. The UN Migration Agency will use the funds to deliver life-saving interventions on Water, Sanitation and Hygiene (WASH) for refugees from the Democratic Republic of the Congo (DRC) and South Sudan, as well as the host communities in Kyangwali settlement in Hoima district, Kyaka II settlement in Kyegegwa district, and Palorinya settlement in Moyo district. The overarching objective of the project is to neutralize the risk of WASH-related diseases such as diarrhoea and cholera, IOM said in a press release. Since December 2017, thousands of Congolese asylum seekers have been streaming across the border into Uganda, fleeing ethnic clashes and human rights violations by armed militia in Ituri, North Kivu and South Kivu provinces. According to UNHCR, more than 80,300 Congolese have fled to Uganda since 1 January 2018 – many crossing Lake Albert in dangerous boats and canoes. 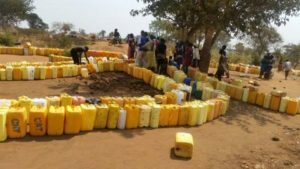 The latest EU project activities will benefit 82,700 direct beneficiaries, under a one-year project titled Strengthening Wash Service Delivery for Refugees and Host Communities in Uganda. The beneficiaries will include 14,700 Ugandan members of the communities hosting the refugee population. This project brings European Union Humanitarian Aid commitments to IOM Uganda in the last 14 months to €4 million. Posted by Geraldine Boechat on July 31, 2018. Filed under Finance, News, Zoom. You can follow any responses to this entry through the RSS 2.0. Both comments and pings are currently closed.